Geoffrey did it! He got Auroara to go down all five steps to the back yard! Up until about noon today, Auroara would willingly only jump down one step to the back door landing. Then she’d fuss and bark to get lifted up, held, and moved down to the ground. This past week, I started lifting her down one more step from the top. She’d be scared and completely stiff. I’d do it again, and she would loosen a little, look at the final stair and the waiting ground. She’d often take that two-step adventure on her own, although a few times she was too tense and had to be lifted down to the final stair from which she could step to the ground. Today, Geoffrey decided it was time to completely end the Sanctuary of the Back Yard for Apex and the other adults. He was going to show Aurora how to get down the stairs anytime she wanted. While I was at church, Geoffrey made the pack all go outside. He had Aurora watch all the adults go down the stairs. Then he helped her down to the ground, one step at a time. He repeated the exercise a few times. When Geoffrey stopped taking her down the steps, Auroara studied the stairs. Then, when Geoffrey went inside, she decided to try out the stairs with no audience. He says he had to sneak up behind her to watch, but she went down all the stairs by herself! When I returned home mid afternoon, Auroara was running up the steps and, with proper encouragement, going down them carefully, but decisively. She can now go out and come in the house on her own schedule. Unsupervised. Already our back hall has more plant and stick detritus from the back yard forays. 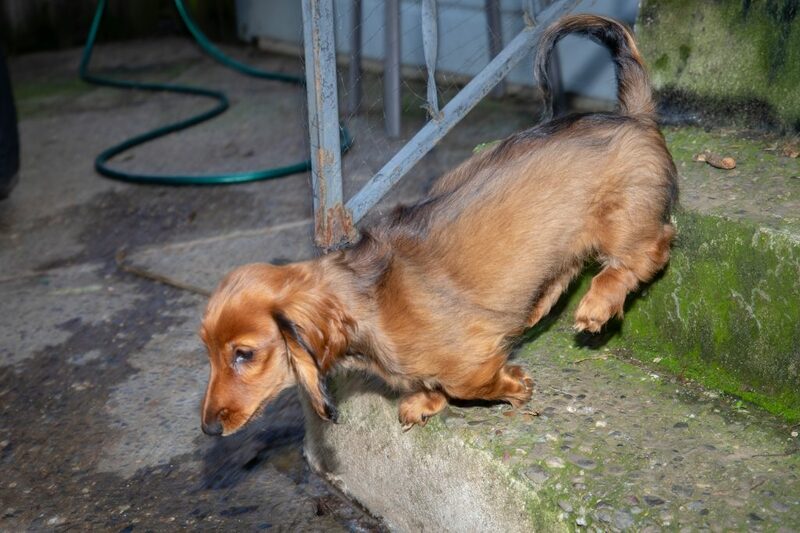 This entry was posted in dachshunds and tagged Auoara, Dachshdunds, puppies2018, stairs, zenith puppies. Bookmark the permalink.